Hannah joined the Northeast Indiana Regional Partnership as the director of business development in January 2016. In this role, she works on the development and execution of the organization’s business development strategy. Prior to joining the team, Hannah served as the director of career and professional development at Manchester University, where she assisted students and alumni in major and career choice, including career planning, research, and implementation. Additionally, she worked with regional employers on recruitment and workforce needs. In her time outside of work, Hannah can be found on the trails running. Over the years, Hannah has run two half-marathons. 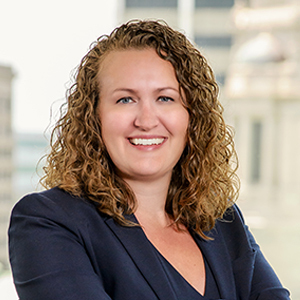 Hannah’s educational background includes a master degree in liberal studies from Indiana University-Purdue University Fort Wayne (IPFW) and a bachelor’s degree in communication from Indiana Tech. She graduated from Young Leaders of Northeast Indiana's Leadership Institute, and serves on the Weather the Fort festival committee. She was also a graduate from Leadership Fort Wayne, a program by Greater Fort Wayne Inc.
Food. Food. Food. Hannah is a big foodie and loves trying new restaurants in the region. In college, Hannah played basketball, and she says that plays a role in her competitive nature.